Kost, Andreas Solar, Marcel Hornig, Eike-Christian Ritzi, Claudia Solar, Anna and Decker, Frank 2019. Lexikon Direkte Demokratie in Deutschland. p. 150. 2019. Coca Yes, Cocaine No. p. 203. 2019. Coca Yes, Cocaine No. p. 128. Krick, Eva 2019. Creating participatory expert bodies. How the targeted selection of policy advisers can bridge the epistemic-democratic divide. European Politics and Society, Vol. 20, Issue. 1, p. 101. Wiesner, Claudia 2019. Inventing the EU as a Democratic Polity. p. 1. 2019. Coca Yes, Cocaine No. p. 84. 2019. Coca Yes, Cocaine No. p. 215. 2019. Coca Yes, Cocaine No. p. 192. Dimova, Gergana 2019. Comparing Strategies of (De)Politicisation in Europe. p. 53. 2019. Coca Yes, Cocaine No. p. 109. Gallina, Marta Camatarri, Stefano and Cogels, Maximilien 2019. Candidates, Parties and Voters in the Belgian Partitocracy. p. 105. Wiesner, Claudia 2019. Inventing the EU as a Democratic Polity. p. 25. 2019. Coca Yes, Cocaine No. p. 27. Pinzani, Alessandro and Rego, Walquiria Leão 2019. Money, Autonomy and Citizenship. p. 109. Niessen, Christoph Schiffino, Nathalie Jacquet, Vincent and Deschamps, Ludovic 2019. Candidates, Parties and Voters in the Belgian Partitocracy. p. 341. 2019. Coca Yes, Cocaine No. p. 1. 2019. Coca Yes, Cocaine No. p. 173. 2019. Coca Yes, Cocaine No. p. 150. Hammer, Stefanie and Schäller, Steven 2019. Flucht und Migration in Europa. p. 325. Arnold, Markus 2019. Narrative des Populismus. p. 27. 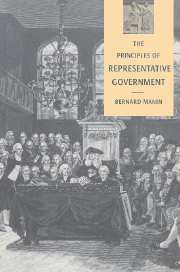 The thesis of this original and provocative book is that representative government should be understood as a combination of democratic and undemocratic, aristocratic elements. Professor Manin challenges the conventional view that representative democracy is no more than an indirect form of government by the people, in which citizens elect representatives only because they cannot assemble and govern in person. The argument is developed by examining the historical moments when the present institutional arrangements were chosen from among the then available alternatives. Professor Manin reminds us that while today representative institutions and democracy appear as virtually indistinguishable, when representative government was first established in Europe and America, it was designed in opposition to democracy proper. Drawing on the procedures used in earlier republican systems, from classical Athens to Renaissance Florence, in order to highlight the alternatives that were forsaken, Manin brings to the fore the generally overlooked results of representative mechanisms. These include the elitist aspect of elections and the non-binding character of campaign promises.